Cup games are not so serious, especially when your team doesn’t come to party, but losing to a championship side on your own turf sure doesn’t feel good for several United fans, some may feel it’s good to avert distractions, they probably have something bigger in sight, good luck to them on that with the overload of differences in the team. 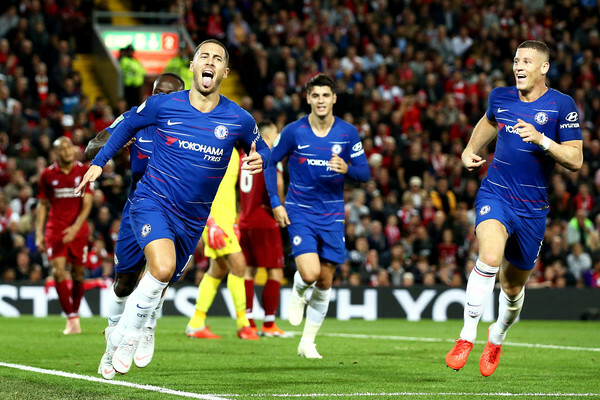 Liverpool tasted defeat for the first time this season in the league cup and not surprisingly to a team that could inflict such on them, what does that tell you about this Chelsea? They aren’t here to joke, they may have serious problems defending their title, wrestling it from whoever seems easier for them; they’ll do it again with Liverpool this weekend, is three premier league points more valuable than cup hopes? We’ll find out at Stamford Bridge on Saturday as the two giants square up again for an instant rematch. Elsewhere, Arsenal are on form, six straight wins in all competitions, Watford next for Unai Emery’s men, an incredible opportunity for them to sneak into the sacred top 4 if they can grind out a win. The reigning champions are home to Brighton as Spurs visit Huddersfield, tricky ties everywhere but we only have on job, deliver our predictions, so shall we? Manchester United are definitely in turmoil, a team can have downtime, it has happened to the best of them all, but this atmosphere at Old Trafford needs urgent attention. A video of Jose Mourinho throwing direct shades at Paul Pogba surfaced on the internet the morning after the penalty shootout loss to Derby County and everyone is jumping on opinions, whatever it was that Mourinho told Pogba to spark that bemused look in the video must be unpleasant, that said, Pogba was wrong to incite words against the manager in a recent interview but the team should move on. West Ham seem to have turned a corner, the destroyed non league side Macclesfield 8:0 in the league cup on Wednesday and held Chelsea to a goalless draw at the weekend, they could have won had Andriy Yarmolenko guided his headed home with Kepa Arrizabalaga wrong footed, they can’t have a better time to play the Red Devils. Statistics however favors United, they haven’t lost to the Hammers in a very long time and it ended in a goalless draw the last time they met on this ground and it was at the tail end of last season. Marcus Rashford will be available after completing his ban, Anthony Martial and Alexis Sanchez should both be available but what version of Manchester United will turn up on Saturday? Marko Aurnatovic sat out the hefty cup win but he should be available to face United. With one eye on the champions league, after being humbled by Lyon on their own perch on day one, they will want to take things seriously now. City are second behind Liverpool, dropped points surprisingly to Wolves but have won twice on the bounce and cruised in midweek to the next round of the Carabao cup, now they have to negotiate Brighton for three precious points. Chris Houghton’s Brighton have been hot and cold, one moment they’re fearsome, the next they’re lukewarm, they lost sheepishly to Tottenham last weekend and now have it all to do against the champions. The loss of creative playmaker Pascal Gross hasn’t helped the cause of the Seagulls and usual suspect to deliver, Glenn Murray didn’t show up against Spurs and the defense panicked severally, with several cracks in the Spurs team, they should have gone for it instead of what they offered on the day. Manchester City dusted Brighton home and away last season, it’s not expected to be different this season but the Seagulls can take inspiration from their result against Manchester United earlier in the season as they head into this fixture. This fixture until 2012 used to be a one way traffic, from time immemorial, the home team always wins, but in November 2012, Steve Sidwell cancelled out Marouane Fellaini’s brace at the death to earn Fulham a point and the Lilywhites were the home side on the day. Everton have been hard to watch this season, they lack identity and you almost can’t tell the version of them that will turn up, with Tom Keane and the previously suspended Richarlison available against Arsenal, everyone expected differently, but it was only Iddrissa Gueye that stood up for something on the day, they were well beaten by Arsenal and they slide further down on the log, a huge headache for Marco Silva. Fulham forced Watford to a draw on Saturday, the Hornets had taken the lead even before Fulham could take their places on the pitch, it took a spirited late drive to force out a goal, and who else would nick it? Aleksandr Mitrovic. This fixture means a whole lot to the job of Marco Silva, he spent so much In the summer, he can’t be lying in 12th with a average of a point a game when he has so much quality in his team, he must deliver results, Fulham spent a whole lot too, well over a hundred million of GBP and 15th isn’t where they would want to be with such investment. Richarlison and Andre Schurrle will both have their moments in this game but it’s actually down to Jean Michel Seri and Gylfi Siggurdsen to dictate tunes, and can Bernard start having more minutes already? Off we go to St James’s Park to have Newcastle entertain Leicester City, it’s been a somewhat poor start, as recently always for the Magpies. Newcastle are one of just three teams without a win this season, not for the lack of efforts but they just have to do more, and again they have to do it against a team that has beaten them four times in the last five meetings. Leicester City bounced back from the humbling in the hands of Bournemouth to beat Huddersfield 3:1 last weekend, they enjoy playing Newcastle, the Magpies only win in recent time over the Foxes came at a time Rafael Benitez’s team were in relegation scrambles last April; for Leicester this season, they either win or lose, they don’t know how to fight for a point, the only time they were indeed close to getting a point from the jaws of defeat was against Liverpool at the KP stadium before the international break. Newcastle will give this their all, they don’t have a choice, they have to, they are down and under, in the relegation zone with just two points to their name, they must fight for their first points in the colours of victory in front of their home fans. Leicester on the other hand will hope Jamie Vardy and James Maddison fires them to victory, they only have the league to worry about at this stage and they just have to do what they have to do. Wolves are on top of their game at the moment, they held Manchester City to a 1:1 draw, did the same to Manchester United and are primed to continue rising, they spent lots of money in the summer and they are reaping the fruits of smart decisions. Southampton on the other hand aren’t looking the part yet, the 3:0 loss to Liverpool last weekend was a testimonial to their shambolic showings so far but they did go to Crystal Palace and got a valuable win which remains their solitary major success this season. Wolves are the better side here to be honest, no two games are the same truly but if they show half of their awesomeness so far this season against the Saints on Saturday it should be enough to send Mark Hughes’s team to mother earth; Southampton don’t have an identity at the moment, they didn’t do lots of reasonable businesses in the summer but they have a squad that can survive the relegation scraps again but if they want more than what they experienced last season, they have to do more on the pitch and off it when the window opens in January. Man for man, Nuno Espirit Santo’s side has the edge, by distance too, the midfield is easily a thing of Ruben Neves and Joao Moutinho, easily the winner everyday and Mario Lemina will need a lot of discipline trying to stop them from dictating the play. Huddersfield played Tottenham twice last season and shipped six in the process without finding the net once, they were a distant second on both occasions. Huddersfield did score first again for the second time this season against Leicester, a goal that earned three instant replies from the foxes, they went to sleep after the goal and were lucky not to be more embarrassed than that; The Terriers are at the foot of the log, no win to their name and just two draws in six attempts, maybe fixtures haven’t been very kind to them but they have played teams they should have beaten but how will they win when they can’t score? Tottenham have guided the ship out of the storm for now, they won in midweek as they took their home game in the Carabao cup to Milton Keys Dons ground and rightly handed Dele Alli the arm band, he grew up from MK Dons and he lived up to it in the penalty shootout win against Spirited Watford side; Spurs beat Brighton last weekend to end a run of three straight losses, they have steadied the ship, it’s time for them to look up and move forward. Priorities is something else, with champions league in midweek, one doesn’t know how many players Mauricio Pochetino will rest for this encounter, give or take it should be quite straightforward for the Wembley stadium tenants. Arsenal have won six straight games in all competitions since losing two on a bounce at the start of the season albeit against Manchester City and Chelsea respectively, they seem to now have an identity and can grind out result even when they don’t play well. Last time out, Arsenal kept their first clean sheet of the season, albeit against Everton that are still looking for their first shut out in the league this season, Pierre Emerick-Aubameyang’s goal was from an offside position no doubt but the man on the line must have been mesmerized by the smooth counter attacking football of the gunners, if Arsenal wins on Saturday, they will usurp the Hornets. Watford have had their best ever start to any premier league season this term, they can even make it better with a win over the Gunners at the Emirates where they surprisingly triumphed in the FA Cup in 2016 and the following PL fixtures between them; Troy Deeney missed a penalty to hand Petr Cech his 200th clean sheet in the premier league enroute Arsenal’s 3:0 success over the Hornets on the day. Jarvi Gracia has done well with his wards so far, the team can wish for something higher than what they used to be known for, the squad is talented but with Janmaat out, Kiko Ferminia will get his chance to start and they are lucky the cup card rules have been reviewed in the context of Kabasele’s red card against Spurs in the Carabao cup. This fixture in the premier league has never ended in a draw, Arsenal have won 80% of the time however and with Lacazette and Aubameyang in the mood, it can only get better. Forget what happened in midweek, shall we? Okay! So Chelsea are home to Liverpool, two of the best in the land, two of the likely champions for this season, at a time they both have everything going for them, at a time they both have it all to do with different European narratives however, it will be a cracker. Liverpool have a perfect record so far, played six won six, scored in all games and conceded in just two, they dusted Southampton cleanly last weekend and they’re doing it without Salah’s rampage as they had last season, they Puskas award winner has scored three so far but we all know this isn’t the PFA player of the year we knew last term. Chelsea are third and buzzing, they beat Liverpool in midweek to twist the plot in this fixture and are even ahead in terms of domestic head to head between these two, it’s a great time to face your closest rivals, a win will take the Blues above the Reds and depending on what happens at the Etihad, it could even be better for Maurizio Sarri’s men. Man for man this is even, Robertson has been menacing down the left and so is Marcus Alonso; Van Dijk is as solid as Antonio Rudiger, Naby Keita and Jorginho are setting the midfield ablaze, Mane is doing what Hazard is doing and Olivier Giroud in place of Alvaro Morata is here to cancel out whatever Firminho is up to, get in here soccer fans this is the real deal. Cardiff are still without a win and this time they have to try against a team that rammed four past Bournemouth last weekend, the Bluebirds are one of the three premier league clubs without a win and this is a great opportunity for them to haul their name off the unenviable list. Early predictions actually tipped them to go down, if they don’t want bookies to cash out on them they had better start winning games like this but hey, it’s Sean Dyche’s Burnley we’re talking about, they ain’t so easy to deal with. Burnley certainly isn’t the same after last season’s reward of Europa engagements, they’re out and can focus on what matters; the rampage against the Cerries last season, which saw Aaron Lennon scoring for the first time in over two years came as a surprise, that was Burnley’s biggest ever win in this division, they were clinical, brutal and decisive, if they turn up like that again in Wales, it will be hard for Neil Warnock’s men to stop them. Interestingly, Cardiff was the last to win in this fixture and it was a 4:0 annihilation of the Clarets in 2012, the rest of the four of the last five ended in a stalemate and it’s actually the first time the duo are meeting in the premier league. The Cardiff men are exciting to watch but their end product leaves too much to be desired, if they don’t take their chances in the game, they will be shocked by Burnley. Like for like here, Bournemouth hosting the Eagles at the Vitality Stadium to end the round and it should be an entertaining one. Bournemouth started fiercely but are beginning to slide down especially with the horrible result at Turf Moor last weekend; Bournemouth always scores, they have a way of bouncing back in the face of defeat but not the case last time out and that only means they have to fire on all cylinders against Palace on Monday, they are eighth on the log and it could have been better for them had they taken things seriously at some points. Crystal Palace are not so relaxed but they aren’t in so much of danger really, seven points on the log, two wins from six and they gave good accounts of themselves in some fixtures they lost, if Mamoudu Sacko didn’t mess up an open goal last weekend they would have won and it would have meant they’d be in the top ten. Wilfried Zaha is the hero at Selhurst, when he’s playing the team is ticking, when he’s not they’re as good as dead, he will be available on Monday to run past the fullbacks at the Vitality Stadium but Fraizer will be doing the same to Van Aanohlt at about the same time.